Ashley Capps’s first book of poetry, Mistaking the Sea for Green Fields, opens with “Hymn for Two Choirs,” a sonnet she claims to read at each reading she gives, and it is one of the best in this fascinating debut collection. The speaker begins by describing “the best apple she ever had,” but by the end we realize that we’re not talking about apples anymore. Capps creates the effect of a crisis averted or, perhaps, a prayer answered. The beauty of the poem comes through in the most unexpected way. It’s never easy to say why a poem affects you so profoundly, and for the moment I’ve given up trying. The only thing I can say for sure is that the poem makes me feel like I’m not alone and that it comforts me in a way no poem has since the poem “Beautiful Things” by Sarah Manguso—it, too, a sort of modified sonnet that contains a similar sort quiet beauty that shifts the universe once you’ve read it. Suffice it to say that by now I’ve committed this poem to memory and when I tell other people about it I can’t really tell them either. Usually the best I can do is to pull out the copy I keep in my wallet and let them read it for themselves. Wasn’t it Harold Bloom who said “strong reading knows that what it does to the poem is right… If you don’t believe in your reading, then don’t bother anyone else with it, but if you do, then don’t care also whether anyone else agrees with it or not. If it is strong enough, then they will come round to it anyway.” Kafka once said that good literature should be an ax to break the ice within you. Reading this debut collection not only breaks the ice, it builds a fire, too. her hair an endless golden ceremony. Her last thing: a wing. Capps’s poetry is full of contrasts that grab the reader and make us find beauty where we think none could exist, and it is these constant shocks that make us keep reading. In my experience it is rare that a book of poetry makes me want to read all the way through in one sitting, but her book does just that. The voice is so distinct, the craftsmanship of each poem done with such care; you can’t put the book down. As a reviewer I would be remiss in not telling you how prevalent the natural world is in this debut collection. Capps is a poet who believes in using her platform to promote animal rights and her stance quietly comes through in her poems. 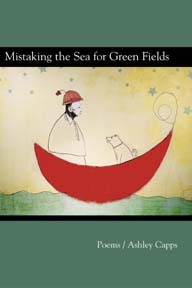 For example, on the cover we see a man and a dog in a boat seated in a way that implies their equality and mutual dependence, as if Capps were trying to remind us that we are all on this journey together, each of us with hopes that get shattered along the way, yet still nurturing an unwavering faith in the future. As you may have already surmised, Capps’s poems are brave and unsettling, comforting and honest. I find myself returning to my copy again and again, each time gleaning something I didn’t catch on the previous reading. I believe that truly gifted poets are able to write in such a way that both the academics and non-academic crowd can all appreciate. This collection does just that. If you are looking for a new voice in the world of poetry, make no mistake, this debut collection is a great place to start. Tasha Cotter’s work has recently appeared in or is forthcoming in Booth, The Rumpus, Contrary Magazine, and elsewhere. Her fiction was recently nominated for a storySouth Million Writers award, and her poetry has been nominated for Best of the Net Anthology 2011. You can find her online at www.tashacotter.com.